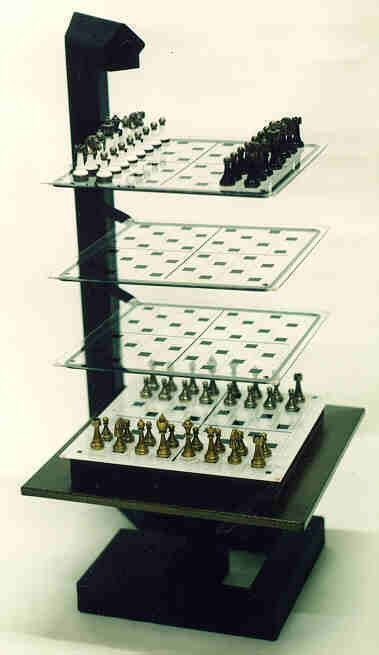 "Chess - The Future Generation"
This game is based on "Chess - The Next Generation" (also detailed rules). Please see also: 3D Chess for 2-4 players. There is no checkmate but rather you must capture the King! This allows you to move into check with the understanding that YOUR King could be captured. Of course, Your Team Color hopefully can block the check! If a King is captured, play continues without that color in the sequence. That colors pieces remain on the board with no influence and can be captured as in regular chess. In that case the other team will have two moves to your one move. Not a good situation to be in. nor does this step need repeating. ... when it reaches the other side of it's board or the opposit side of the general direction of it's pieces on any level, it becomes a 'Crowned Knight' with a red checker piece put underneath it (or something that clearly shows that it is different). This enables it to also move like the shape of an 'L' rightside up or upside down. In other words, it can also now move one square forward, (or backwards, or the immediate left, or the immediate right) and down, or up, two squares. Therefore, if it was on level 'A', it could now move to level 'C' in addition to it's regular moves. Cb1, Ca2, these being the two new additional places it could move to, once Crowned. This is now the only very powerful strategic piece that can move 2 levels in one move. If it was in the middle of the board it can control 16 squares. This PIECE POINT value would now be worth 7 compared to 3 points before it was crowned. It is very strongly recomended to use a white stone or object to indicate who's move it is. 'That is my move!' This is done because everyone can and will lose tract of who's turn it is to play! 'Chess - The Next Generation' or conventional 2D chess which takes only 30-45 mins. This game is all about Sequence and Playing as a Team! No matter how good you are, the side that plays the best as a team, will win! This is, The Ultimate Chess Challenge! You will be sitting on the edge of your seat in this Ultimate Chess Challenge! Learn while answering an 8 question quiz! Ho Math and ChessTM is a world leader in integrated math and chess teaching. It produces the world's first math and chess integraded workbooks for elementary students. Ho Math and ChessTM offers after-school tutoring in math, chess and mathematical chess puzzles. Have a quick laugh on me. ...never want to go back to a regular flat board again.